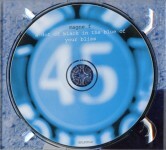 Magne's new album "A Dot Of Black In The Blue Of Your Bliss" was available as a free download from his MySpace from 22 January 2008. The album was released in the UK on 19 May 2008 and in Norway on 26 May 2008. All songs were written by Magne F, except "The Longest Night" by Magne F and Martin Terefe. The album was produced by Magne F, Johnny Sjo, Karl Wennerberg, Dan Sundhordvik, Guy Berryman, George Tanderø and Jon Marius Aareskjold with strings arranged by Bernt Moen. The album was mixed by George Tanderø and mastered by Bjørn Engelmann. A very special limited edition of the album was available via the internet. Magne hand painted 300 unique covers which together made up one large piece of artwork. Each cover was sent out to the 300 fans who pre-ordered the album, together with a 10" picture disc, CD-Rom (featuring the album tracks plus enhanced section showing clips of Magne painting the covers) and a large poster of the 300 piece picture. 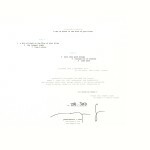 The back of the LP cover is white with "collector's edition" and "a dot of black in the blue of your bliss" printed towards the top in respectively grey and black small letters. The 6 tracks are printed underneath, together with track information. 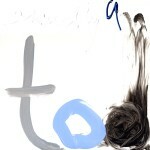 The limited number (out of 300) is hand written, as is Magne's signature. 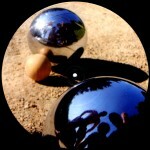 The picture disc features a shot of two metal balls (as used in the game of boules) and jack ball on sandy ground. 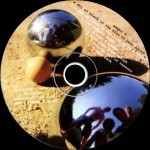 Reflections of the players can be seen in the boule. The reverse of the disc is blue and black withe the tracks listed in white. The CD-Rom is also a picture disc and is similar to the front of the 10" with the title and tracks at the top in black and white letters respectively. There was a test pressing of the LP which is a plain white disc with black rim and a thin yellow line down each side. It has the same groove numbers and tracks as the limited release, but hasn't been printed on. Surplus covers, CDs and discs were used for promotional purposes. The LP sleeve has a plain front and the back has printed text, but no autograph or limited number, otherwise this promotional pack is similar to the special limited edition. 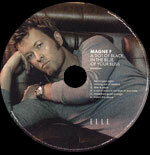 Magne's album was also given away free with the Norwegian magazine "Elle" (released 21 April 2008). The 6-track CD is a picture disc featuring a shot of Magne resting on a sofa. It has a different track list compared with the limited edtion. The UK release comes in a fold-out digi-pak with booklet. 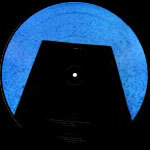 The cover is similar to the B-side of the picture disc; a black parallelogram on a blue background. magne f is printed in white letters above the parallelogram with the title in black and blue letters above and across the top of the parallelogram. The back of the digi-pak features a blue-tone shot of Magne and his band standing in a garden in front of a tree. The tracks are printed in white (except for the word blue which is printed in blue) at the bottom. One end of the digi-pak houses a 6 page booklet with blue toned pictures of Magne and his band plus song lyrics. The inside of the digig-pak features a blue-toned shot of sandy ground with a boule and jack ball in the centre. The disc sits in a transparent tray in the middle. The disc is blue and black with number 45 printed in white in the centre of a blue circle. The inside flap of the digi-pak features a shot of a keyboard with track information printed in white above and below. The album features three additional tracks "forgotten not forgiven", "too far, too fast" and "watch this space" plus a very short untitled intro track and an experimental hidden track 2:33 after the end of "watch this space". There is a promo CD which has the same track listing as the UK release, but just comes with a white paper insert with the tracks printed in black. The disc is plain with the titles in black at the top and "For Promotional Use Only - Not For Resale" printed at the bottom. Norway: The Norwegian CD release differs slightly compared with the UK-issue by Genepool. The digi-pak is more glossy and the booklet (same as UK edition) sits in a pocket rather than in the end of the digi-pak. The inside flap of the digi-pak has some different text on the lower part (e.g. Universal Norway) and the track listing on the back is not numbered and features "Intro" as track 1. The bar-code is a sticker rather than printed on the sleeve and on the spine, "magne f" is printed in white compared with "magne f a" on the UK edition.